Seven bounty hunters have been indicted on first-degree felony murder charges for allegedly killing an unarmed man and wounding another individual after targeting the wrong car outside a Clarksville, Tenn., Wal-Mart. The charges stem from an April 23 incident, in which police say the bounty hunters shot at four people in a sedan and then pursued them for 7 miles. None of the individuals in the sedan were wanted on outstanding charges, CBS News reports. According to the report, the bounty hunters were looking for someone else, and there is no indication that any of the victims in the car fired at the bounty hunters or were even armed, according to police spokesperson Jim Knoll. Jalen Johnson, a 24-year-old father of three, was killed in the incident. His family said that Johnson was an innocent man who died in an act of terrorizing violence. Johnson’s uncle Toni Jenkins reportedly told the Associated Press that his nephew and the three other men who were in the car with him didn’t know why someone would suddenly block their car in the Wal-Mart parking lot. The men, fearing that it was an attack by a gang, tried to run away. Jenkins claims that the bounty hunters started shooting in the parking lot and continued to fire on the men even as they fled, ramming into the vehicle along the way. CBS notes that Clarksville police would neither confirm nor deny the details, but authorities have acknowledged that they are concerned about how the bounty hunters put people at risk. As CBS notes, bail bondsmen can hire or act as bounty hunters to bring in those who violate the terms of jail bonds, but the use of deadly force is not permitted unless it is in self-defense. 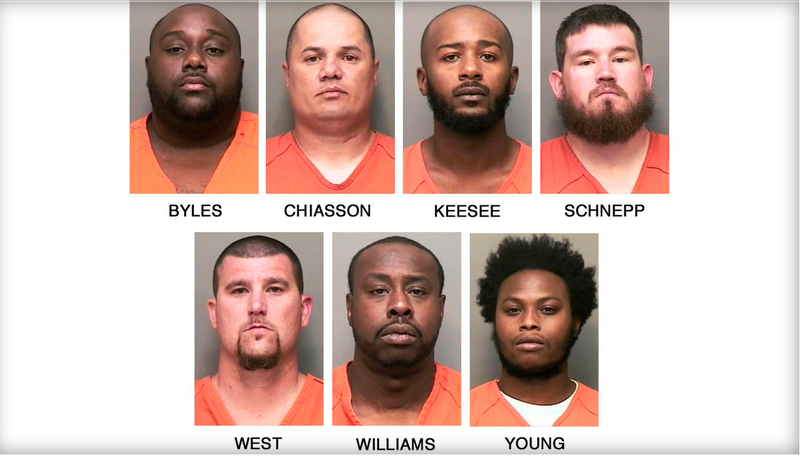 All seven bounty hunters—identified as William L. Byles, 31; Kenneth Chiasson, 38; Antwon D. Keesee, 32; Jonathan Schnepp, 31; Roger D. West, 31; Prentice L. Williams, 34; and Joshua Young, 27—are facing charges of first-degree felony murder, three counts of attempted second-degree murder, three counts of especially aggravated kidnapping, attempted especially aggravated kidnapping, four counts of aggravated assault, employing a firearm in the commission of a dangerous felony and felony reckless endangerment. Some of those charged were bonding agents, while others were solely bounty hunters, according to the report.